A lot of my (mainly non-Twitter using) readers may be unaware of the controversy surrounding designer Hidden Eloise and greeting card giant Paperchase. In short, Hidden Eloise alleges that a design which Paperchase are using on a variety of products has lifted the central image of a girl from one of her own works He says he can hear the forest whisper. “We bought the designs from a reputable central London Design Studio along with a number of other designs on good faith. He added: “We have not done anything wrong. Our reputation is of course very important to us. We spoke at length to the Design Studio in question and they categorically denied any plagiarism. “What upsets us as a whole is that a lot of our good customers have been angered by this and there is no reason for it. Mr Melgund said the issue raised serious concerns about the “powers, and there in the danger of Twitter”. “I am sure it can be beneficial but if you get an untruth (on it) it can be very dangerous,” he said. When creating the group of designs bellow I used the outline pose of your Hidden Eloise Girl in one of the designs to create a new pose for my princess. I did not intend to copy your character but use its pose to create a new design for my own character, my intention was not to copy your character, I now realise the pose was too close to your Eloise and apologise to you for this, I also apologise to paperchase for the trouble this has caused. What is disturbing about this whole incident is that Paperchase have left it to both the freelance designer and the design agency who commissioned her to take a bullet on their behalf. Throughout the whole process, Paperchase have insisted that they had reassurances that it wasn’t a copy and that settles the matter. But it doesn’t because it is blatantly obvious that one design is based on the other. They didn’t need lawyers or reassurances to confirm that a wrong had been committed; they just needed eyes and a conscience. Let’s not forget that Hidden Eloise originally raised the issue with Paperchase in November; they had three months to avoid what is now a public relations disaster for them. Their calculation must have been that there was very little that an independent designer of modest means could do to them. Timothy Melgund’s comments on Thursday only reinforce the impression that his primary motivation was to dissemble rather than right a wrong. That he went running to a rightwing newspaper to give him a sympathetic hearing and trotted out the usual line about Twitter inciting the mob (© 2009 Jan Moir) only makes him even more despicable. This suggests not only contempt for Hidden Eloise but for his customers. Frankly, I would describe it as a Gerald Ratner moment were it not so unfair on Ratner: at least he was only telling the truth. Whoever lied to who, Paperchase are the big guys in this incident and they are the ones who should have been big about it. To not do so speaks volumes about their ethics and values. I’ve used Paperchase quite a lot over the past few years; they’ve just opened a new shop near where I work and assumed I would go on doing so. After this week, I’ll be making the strenuous effort of walking around the corner in future. Spread the word. A final thought on copyright: this is yet another example of how existing copyright laws appear to do more for protecting corporate interests than in protecting the rights of artists. The costs of Hidden Eloise bringing forward a court case on this would have been prohibitive, yet record companies feel they can go around threatening their customers with jail – and in some cases pursue court cases against them – merely for downloading a song on a non-commercial basis. Isn’t it time we reassessed this? PS I’m bookmarking this article in several places not to self-aggrandise but to ensure it is given wider coverage. In an attempt to do the right thing and end this episode we want to briefly set out what happened here, offer our sincere apologies to all involved, and go back to operating our business as we have been doing for many years – albeit with a few lessons learnt from this incident. So, please bear with me. • Paperchase bought a number of pieces of artwork from Gather No Moss in October 2008. • By the end of November 2009 four items that contained the ‘copied’ image were on sale. • On 27 November, Hidden Eloise contacted us saying that her work had been plagiarised, and we – as we would always do – went immediately back to our source to verify the claim. In retrospect we should have withdrawn the items from sale while the claim was investigated – our mistake. • The studio, Gather No Moss, wrote back to us on 1 December stating that the image we had bought “was definitely not based on Hidden Eloise’s”. Again, in retrospect we should have withdrawn the items, but this was categoric confirmation that we had not been sold a plagiarised image. We assumed we had been told the truth. Another mistake. • We advised Hidden Eloise of this confirmation on 2 December and heard no more until last Thursday when the accusation on Hidden Eloise’s blog gained worldwide coverage. While we established the “real” truth, we immediately removed all potentially offending items from sale and retraced our thinking. Press reporting could have been more accurate and our attempts to calm the situation through our web announcements met with limited success. Our communication could / should have been better. • By Friday the truth emerged, and you can read the two statements from Gather No Moss and their freelance illustrator, Kitty Mason, below. This is not about blame, as some have suggested, but a genuine attempt to discover what went wrong. You must decide for yourselves where the faults lie. In retrospect we, Paperchase, are certainly not without blame. So, we have been chastened by this experience and offer Hidden Eloise, our customers and those from the social network community our sincere apologies that we were not more rigorous in establishing the truth in the first instance. Finally, please do not take some of the wilder accusations you might have read about our business too seriously. We are absolutely committed to design and independent illustrators alike. We are lucky in that the available artistic skill is so vibrant that it has allowed us to build our business, along with our loyal customer base, to where we are now. Gather No Moss and Kitty Mason wish to make the following statements. “Gather No Moss purchased the design known as ‘Alice in Wonderland’ from Kitty Mason in September 2008. Paperchase bought Kitty Mason’s design from Gather No Moss in October 2008. At the end of November 2009, the Artist named Hidden Eloise, contacted retailers Paperchase accusing them of plagiarism. Paperchase contacted Gather No Moss and asked them whether there was any truth in this allegation. Gather No Moss then asked the designer, Kitty Mason, whether she had copied Hidden Eloise’s ‘character’ (called – He says he can hear the Forest Whisper) in her own design. Kitty Mason clearly stated to Gather No Moss that her ‘character’ was definitely not based on Hidden Eloise’s” ‘character’ only the pose was the same. Gather No Moss then conveyed this to Paperchase. We are issuing this statement, to clarify our position and to hope to clear Paperchase of any direct fault. We apologise unreservedly to Paperchase, their customers and to the artist, Hidden Eloise for this very regrettable sequence of events”. “I created the design known as “Alice in Wonderland” in September 2008. I copied the outline pose of the Hidden Eloise ‘character’ (called – He says he can hear the Forest Whisper) to create a new pose for my ‘character’. I did not intend to copy the girl but use her pose to create a new design for my own ‘character’, I now realise it was wrong to do this. In November 2009 Gather No Moss contacted me regarding Hidden Eloise’s allegation, I told them that my ‘character’ was definitely not based on Hidden Eloise’s ‘character’ only the pose was the same. I would like to offer a full and unreserved apology to Paperchase, their customers, Hidden Eloise and Gather No Moss”. To recap, readers may recall that, two months ago (it really was that long), I got my knickers in a twist over an article in the Telegraph about Jo Swinson MP and her expenses. I – and others – complained to the Telegraph – as well as the Guardian and the BBC. We got a response from the Telegraph and a clarification from the Guardian, but nothing, nada, zip, from the BBC. The piece you refer to was where we reported the “Claim” by the Telegraph and, where appropriate, the MP’s “Response”. The Telegraph said receipts submitted to the fees office by Ms Swinson, for reimbursement, included the items. They said she had denied claiming for the eyeliner. We reported both those facts. They published the receipt on their website. Ms Swinson had told them that the eyeliner was not claimed for but had been on a receipt with other items claimed for. The Telegraph said only cosmetics appeared on that receipt. The page you refer to is a summary page and it is not possible to go into all this detail on it. The redacted version of the expenses claims from Parliament fails to clear the matter up as the receipts in question are redacted so it is not possible to compare the value of the claim with the receipt submitted. There is no doubt about the tooth flosser however as Ms Swinson wrote that herself on to the claim form and it was not redacted when published. As for our complaints procedure, the page you selected to make your complaint was the General Feedback webform. You should have received an automatic response which said: “We are unable to answer all e-mails individually due to the large amount of feedback we receive.” There is a separate form for complaints, which would have been a better place for your correspondence. This would then have ensured a reply. We would disagree that the options offered on the Newswatch page are confusing; it’s really for senders to determine the nature of their correspondence. To have all e-mails going to one inbox where they are guaranteed a response would mean us replying to several hundred e-mails a day from our department alone. So, your e-mail was read, but it was felt that no action was needed to alter our story and no reply was sent. Your second complaint was made via the BBC’s central complaints website and was forwarded to us the following day, and then passed on to the political team. I can only apologise for the delay in responding; that is down to us. First of all, I have to say that I do not accept that this email is confidential. There is no reason for it, we are discussing things that are in the public domain and it would appear to go against the principles of the Freedom of Information Act which the BBC is subject to. I will be publishing your response, and my reply, on my blog. Secondly, thank you for eventually replying to this. I would be happy to accept your apology if you could do me the courtesy of explaining a) why such an extraordinary delay and b) what specific action is being taken to prevent such delays in future. Working backwards in your email, for the record I did NOT receive a response from your complaints website when I submitted either complaints. I did check my spam box at the time, and have just done so again. Have you checked to see if this facility is in fact working? You state that “We would disagree that the options offered on the Newswatch page are confusing; it’s really for senders to determine the nature of their correspondence.” I was taken to that page upon clicking the option for “General comment For comments, criticism, compliments and queries about the BBC News website or coverage of an event or story.” At that stage, technically, I was asking for a correction; I wasn’t issuing a complaint. Instead of merely asserting that you are right and I am wrong, what research have to carried out to ensure that people are not being confused by this? Are you willing to concede that if such research has not been carried out, it should be considered in the interests of providing a good public service? In terms of the complaint itself, you state that “the page you refer to is a summary page and it is not possible to go into all this detail on it.” This may be so, but that is no excuse for inaccuracy. Your piece – and your response – IS inaccurate. You state that “the Telegraph said receipts submitted to the fees office by Ms Swinson, for reimbursement, included the items” but the Telegraph article (whatever other issues I may have with it) goes to great length to make it clear that NOT all the items on the receipts were submitted for reimbursement. That is 29 words, as opposed to the original which was 26 words. If you are really worried that this makes it too long, you could remove “the youngest in the Commons” which is entirely irrelevant (and could be inferred as innuendo in any case) and would save you 5 words. What I find most outrageous of all however is your refusal to even take action on changing the name of the constituency. There can be no argument here. Her constituency is called East Dunbartonshire or Dunbartonshire East. There is a seperate constituency called Dumbarton. Do you think it is unreasonable of me to surmise that given your failure to even make this correction, you aren’t taking this complaint seriously? There are a number of questions there. However, given how long it has taken you to reply to my formal complaint, I feel it is reasonable that you answer them. Sadly, I think my chances of getting anything out of these – even for them to correct the name of the constituency – are pretty remote. There is a wider issue about how the BBC handles complaints. As a public service, it ought to be better than the typical newspaper; instead it is considerably worse. I’ve been thinking a lot about this recently and can feel a campaign percolating in my brain. Finally, I should belatedly link to this article on journalism.co.uk, with full marks to Stephen Tall for taking Andrew Pierce to task. On 23 May 2009, I wrote a complaint to the BBC regarding the above mentioned article using the BBC News’ Newswatch service (http://news.bbc.co.uk/newswatch/ukfs/hi/newsid_3990000/newsid_3993900/3993909.stm). To date I have received no reply. a) The content of this specific web page. b) The way in which the BBC handles comments and complaints. “Thank you for your email of 27 May 2009, which was addressed to telegrapheditorial. “While we note your comments, we believe that the above article was written and in a way that will be readily understood by our readers. The facts are not in dispute and Jo Swinson was given full opportunity to respond. Following publication we were contacted by a Liberal Democrat press officer on Ms Swinson’s behalf. This was only to draw our attention to part of a headline on the website version of the article, whichwas then modified as requested. The matter was resolved amicably and no other issue was raised. “We are satisfied that there has been no breach of the PCC Code of Practice. The nature of my complaint to the Telegraph and Guardian was different to that of the BBC in that, while I assert the newspapers had both written misleading articles (something which the Guardian now acknowledges), neither of them had issued factual inaccuracies, the BBC article was factually wrong. 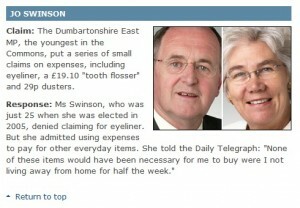 To reiterate: the BBC story states that Jo Swinson claimed for “eyeliner, a £19.10 ‘tooth flosser’ and 29p dusters” while the original Telegraph article merely states that they appeared on receipts that were submitted. Indeed, the Telegraph makes it clear that not all the items on the receipts were claimed for. I would still object to the BBC using the same precise wording in the Telegraph article as it is misleading (why is it newsworthy that an MP purchased makeup out of her own pocket). But the BBC, to date, have not even gone that far. I have always been critical of the way the BBC handles complaints. At the top end of the scale it has programmes such as Points of View and Radio Four’s Feedback which appear to exist for no better reason than to provide BBC producers and opportunity to condescendingly explain why viewers and listeners are wrong to complain about their programmes. Since the rise of the internet, the BBC has failed to use this opportunity to make itself more accountable and responsive to complaints, even ones of a purely factual basis. If a direct email address is not an option, I should have been able to upload supporting documents. I should have received an acknowledgement that the message sent via the web form had been sent, including a copy of the original complaint for reference (I anticipated this on this occasion). I should be able to track the progress of the complaint online and be able to see if it is still being processed and what the conclusion has been. If any correction is made, the website in question should include an acknowledgement that it has been revised. Most decent complaints services in the commercial sector provide this level of service as a matter of routine. In my case, I have no evidence that my complaint has been dealt with at all. While the picture of Jo Swinson has been corrected (which I only mentioned as an aside), the fact that her constituency name has been wrongly listed has not. While I would content that all of my complaint is purely of a factual nature, the question of her constituency’s name is surely beyond doubt (for the record, there are three similarly named constituencies: Dunbartonshire East, Dunbartonshire West and Dumbarton)? I certainly have never received any acknowledgement. It is not clear from the website whether I should use the “Newswatch” section in the first instance or use this service as a matter of course. I assumed that Newswatch should be used in the first instance while a formal complaint such as this should only followed if I was not happy with the initial response. The BBC website does not clarify this and it is most confusing. It would appear that complaints issued via “Newswatch” are not dealt with at all. I can only hope that complaints made via this route will be treated with more respect. So, irrespective of the conclusion of my specific complaint, I am asking you to look into how the BBC might better handle complaints in future. I have already written to the Telegraph about this story (see below). Your article goes significantly further than the Telegraph article. The Telegraph at all times are careful not to actually claim that Jo Swinson MP claimed cosmetics on expenses, merely that cosmetics had appeared on receipts that had been submitted to the Fees Office (nonetheless, I would still contest that this is highly misleading – and almost certainly mislead you). It is wholly unacceptable of the BBC to republish – and indeed embellish – claims made by a commercial newspaper without seeking to substantiate them first. This isn’t journalism, this is engaging in a game of Chinese whispers. I would therefore ask that you publish a retraction to this story, together with an apology to Jo Swinson. “i) The Press must take care not to publish inaccurate, misleading or distorted information, including pictures. 1 that although receipts containing those items had been submitted, there is no actual evidence that these specific items had been claimed for. Indeed, this claim is explicitly denied by Jo Swinson herself and no evidence has been brought forward to give us cause to doubt this whatsoever. 2 furthermore, that in at least one case the items which had been claimed for were clearly marked by an asterisk. In the case of the eyeliner and dusters this was not the case. 3 the claim that Jo Swinson is ‘known in Westminster for the attention she pays to her appearance’ is entirely unsubstantiated and innuendo-laden. There is nothing remarkable about a Member of Parliament not wishing to look unkempt; indeed they would be open to criticism if they did so. 4 the headline epithet ‘makeover queen’ is equally unsubstantiated. No-one appears to have called Jo Swinson this apart from the article’s author, Rosa Prince, herself. 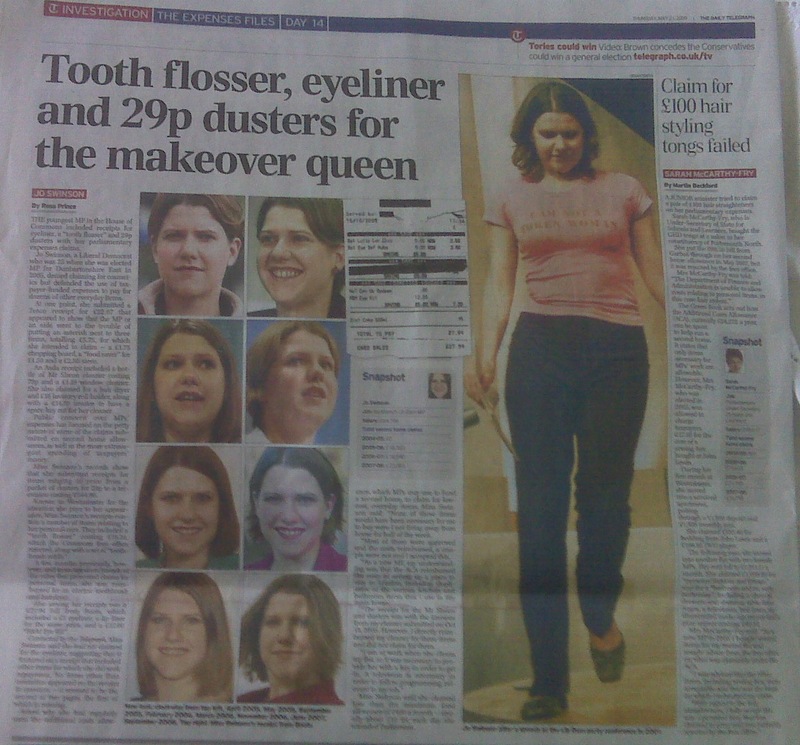 5 the page design is clearly intended to convey the idea that Jo Swinson has had numerous ‘makeovers’ – yet the photographs provided are merely pictures of her looking slightly different over a period of eight years. 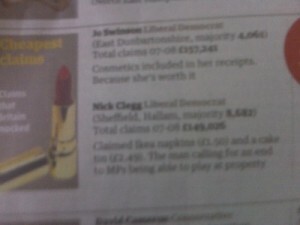 The article, ostensibly about MPs’ expenses, is clearly intended to convey the impression that Jo Swinson has been buying makeup and charging taxpayers. Given that the article itself contains no evidence whatsover to indicate that this might be the case, the article is certainly misleading. Including a denial by Jo Swinson does not go anywhere near to correcting this as it works on the ‘no smoke without fire principle.’ Furthermore, nowhere in the article do you state Jo Swinson’s impeccable record in calling for MPs’ expenses to be published and for the system to be reformed.